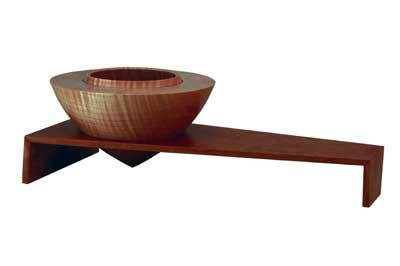 I came across Mark's work by chance whilst doing some woodturning research online. I was amazed and also inspired by the complexity of his platters and the way in which the three-dimensional forms appeared to tell a story. Mark starts by telling me about his background: "I have always admired my mother's broad artistic talent and my father, an RAF pilot officer turned successful businessman, has been a fine inspiration for me, too." With these influences and the opportunity and encouragement to grow in whatever direction suited him, Mark sees it as somewhat inevitable that he became artistically creative, employing machinery and tools. Mark tells me about one of his earliest memories: when his parents took him to the White Mountains, New Hampshire. There, the resident blacksmith at Santa's Village was forging finger rings from farrier's nails for the young visitors: "He kindly sized one for my wee finger. At that impressionable age I was struck by the fact that such a simple utilitarian item as a nail could be fashioned into something attractively ornamental, personal and so far removed from its intended function." Later, living in Canada, Mark would watch his mother sketch, paint and sculpt and his father craft fine furniture from rough lumber with forethought, the most minimal sketches and basic hand tools: "I learned about thoughtfulness, clean lines, mechanical function and precise craftsmanship at every stage." Technologies in Toronto, where he studied the theories of technology and practices of photography, cinematography, videography, audio recording and how to create in those media filled Mark's days and sparked his creativity. "Graduating with Dean's high honours, the greatest scholastic achievement of my life, demonstrated that expressing myself and employing technology as a tool was my forte," recalls Mark. Mark's first foray into making circular things came about a couple of years later, whilst employed as an AV technician, where he learnt to braze metals: "I decided one Christmas to make gifts of my own design. Returning to my earliest inspiration, I began arranging horseshoe nails of various sizes to create a circular sunburst pattern." Mark brazed these together; cleaned, hammered, lacquered and fixed them to rectangles of lightly wire-brushed and lacquered, weathered barn-board. "The contrast of the brassy metallic sunburst against the background of rich organic barn-board was stunning," Mark says. The fulfillment Mark felt rekindled the notion that if he let his creative side come forth, he was capable of crafting things which others enjoyed as much as he enjoyed making them. "I was bitten," says Mark. In 1988 he discovered the lathe: "Having made a lot of furniture for my loving wife Susan, plus boxes, trays, cutting boards and a variety of other linear gifts, I turned to the lathe to put my hand to circular creativity again. This oh-so different, dynamic, subtractive creative process totally absorbed me," he tells me. This marked his true exit from the world of audio and video. 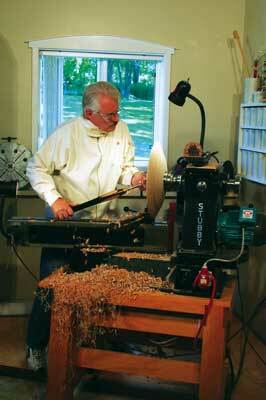 Mark soon became the owner of a fine woodworking tool store in Toronto: Fleetwood Tool Supply. "I chose the promotion of woodturning as my main business focus, stocking products from many internationally recognised woodturning companies, plus a host of books, videos and periodicals, including Woodturning," Mark recalls. 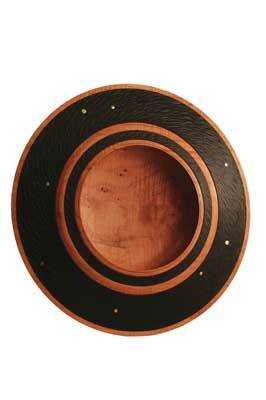 Mark then went on to co-found the Woodturners Guild of Ontario (WGO), basing the guild in a +500 sq. ft. purpose-built room at Fleetwood Tool Supply, dedicated to the promotion and training of the craft to an ever growing membership who shopped, shared experiences and socialised at the store. In 1991 Mark chose to close Fleetwood Tool Supply, after which point, Mark became a consultant technical writer and product specialist for Record Tool in Canada: "In 1992 and for the next eight years I was President of the Canadian Woodturners Association, all the while actively pursuing my passion for woodturning in my home-based shop," he says. 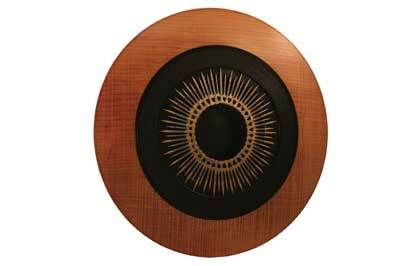 Once Mark felt he was producing some styles that were personal expressions in wood alone, he returned to his creative roots, adding metal to his creations: "Brazed sunburst patterns of horseshoe nails adorned my turned and textured platters as an overlay and quickly became my signature work as I took my creativity to the next level: turning full-time for gallery sales." 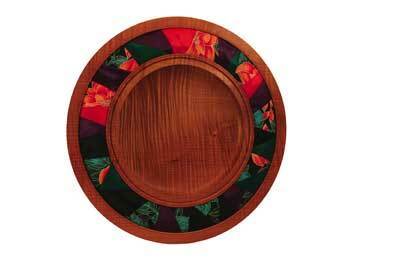 Since 1992 Mark has enjoyed a very satisfying life, expressing himself through woodturning; supplying select Canadian galleries with distinctive bowls, salad servers, vessels, platters, lidded boxes, tables and stools of his own recognisable design. "It's satisfying to know that my work is being enjoyed and featured in corporate, government and private collections all over the world," Mark tells me. Looking at Mark's work you will notice several common factors: clean form, simple detailing, contrasting features, subdued use of colour and low lustre, penetrating finishes: "I craft work which I believe to be timeless, suiting any decor and made to live on as heirlooms, should the owners choose to honour them as such. My work always exhibits contrasting elements; flowing form with crisp detailing; ebonised texture against natural figure; hard metal against warm wood; colour enhancing nature. Every piece I make is crafted to exacting standards and each piece includes a little visual or tactile surprise." As a maker, Mark constantly questions as he makes each piece: how will light strike it? How will it feel when it's being held? Where will a tactile or visual surprise be the most appreciated? How can I enhance the figure, grain, features and colour of this piece of wood to its greatest advantage? What mood do I want to convey or create? Do I want this piece to exude masculinity or femininity when it's interacted with? 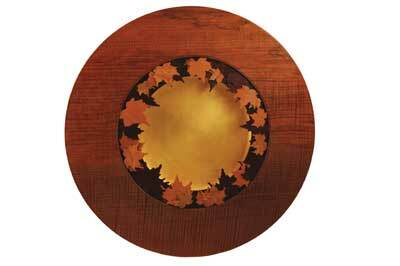 "Much of my work is turned from bigleaf maple, a medium density hardwood which grows rapidly. It features widely spaced annual rings and is readily prone to intense figure which, depending on its appearance, may be dubbed 'fiddleback,"tiger striped,' 'angel's wing,"popcorn'or burled." Mark is a solitary person, relishing the creative time in his workshop. He prefers the companionship of music to keep himself buoyant while drawing on his imagination and spontaneity of his lathe-craft to guide him to new forms: "I like to rough out several pieces of the same style, half a dozen or more, then take my time completing each individually." He generally avoids interacting with the work of other turners, preferring to appreciate creativity in other media. "Art deco and Arts and Crafts architecture and interior design; the ceramics of Lucie Rie; the sculpture of Constantin Brancusi etc. all excite me. Being inspired by makers beyond my craft, I maximise my stimulation without conflict or criticism and can translate how their work affects me in my own way, keeping my output fresh and unique." Having been sidelined by a severe motor vehicle accident since late 2004, Mark has rejoined the mainstream of his craft with a renewed focus, rekindled passion and fresh ideas to execute. "I am blessed by being promoted by understanding and supportive gallery owners and staff, keen to see me back at the lathe and anxious to see new work from me." 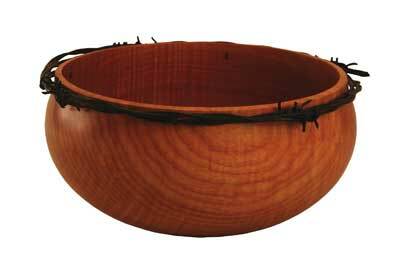 Mark's website has been very useful to both chronicle his past and as a single forum to showcase the styles he is most proud of: â€œMy site will be regularly updated as I have new collections to talk about and I hope that it will be considered as a teaching tool for new woodturners to critique or be inspired by." Finally, if you see a blue Mini Cooper bombing around, it just may be Susan and Mark, now celebrating 35 years together, out looking for inspiration or delivering a new body of work: "Honk and wave; I'll do the same back," says Mark. For more information about Mark's work see website details opposite.